Beautiful Scandinavian styles and designs have been slowly conquering our homes. After taking over our living rooms and bedrooms, this minimalist yet elegant style has found its way into our kitchens. If you also have the urge to redecorate your kitchen and give it that soft touch of Scandinavia, do not feel guilty. Instead, try out these simple tips. This open and bright style will need lots of light. The reason behind this feature of the Scandi design is that the Scandinavia gets up to 60 days of Polar Nights, which means less light during that period. They need to incorporate as much light as possible during such harsh winters, and that is why they opt for bright colors and big windows. Even though we are not facing the same geographical problem, it does not mean we should block out the light. Install one big floor-to-ceiling window in your kitchen and enjoy that warm sun while cooking. Letting all this light inside will instantly light up the mood, provide warm comfort and positively affect everyone’s health. However, if you still need some privacy, you can always install elegant wooden shutters to complement the whole style. Since this is one of the most minimalist styles, it requires functionality and perfection. Your home should be open, airy and it should preserve a flow that enables easy living. The same goes for your kitchen; everything in it should have its purpose, everything should be clean and, most importantly, it should work properly. No matter how beautiful something looks, if it does not work, you should not keep it in the house. Also, never fail to regularly check up on all the installations and with everything working like it is supposed to, your lives will become so much easier and cozier. Does white kitchen sound boring to you? 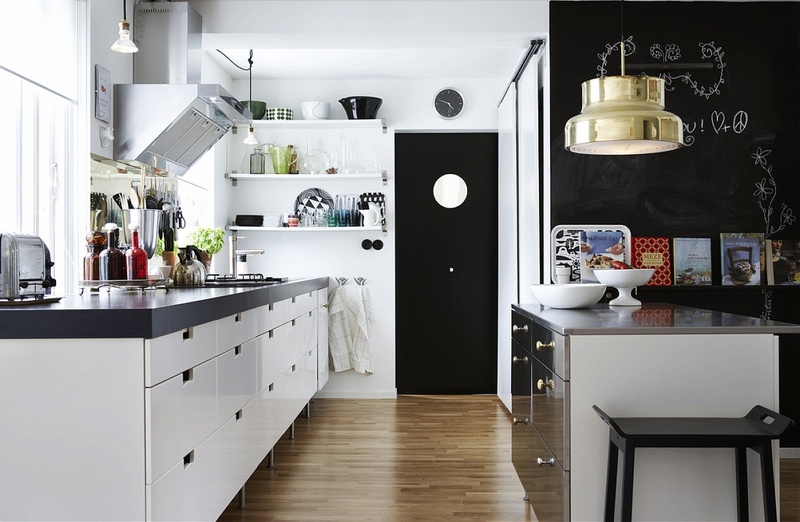 Well, if you do it Scandinavian style, all-white kitchen is everything but boring. Instead of just picking out random white cabinets and painting the walls in white, you should consider giving your kitchen more depth. Incorporate furniture made out of white beech wood and even install white wooden floors. You can match the rest of the interior with white paint, but make sure to have small light colored details. Pick out a few old plates made out of copper and proudly display them in open cabinets, have a few grey and beige decorations, such as table cloth or seat covering and arrange a few plants to provide warmer atmosphere and make an amazing centerpiece. If you are searching for more than an elegant all-white look, then you should turn to some neutral tones. Muted tone of cool grey, pale blue and cream are one of the trademark tones of Scandinavian design and they are unique to its minimalism. If you want your kitchen to be this unique you should consider adding details in these colors on the white or soft grey base. Have pale blue cabinets, cool grey kitchen table and chairs and a few white and cream details such as displayed dishes and decorations and your kitchen will shine. Contrary to this soft design, there are some of the Scandi styles that are actually bold and strong. So if soft colors are too soft for you, do not be afraid to make a bold statement in your kitchen with bold bright colors and graphic arrangements. Kitchen may seem like an odd place to find the textures and fabrics, but our fellow Scandinavians beg to differ. Even though it may look bare, the Scandi looks are always comfortable, and so your kitchen should match that comfort. Lay out some woven rugs in light but lively colors; add some soft tasseled cushions on the chairs and some faux fur to cover bare surfaces that are rarely used. These simple textures will immediately turn your cold kitchen into a heavenly place filled with family comfort. The idea of visiting or even moving to the comfort and beauty of Scandinavian countries is attractive but somewhat unattainable. Incorporating their designs and minimalist styles are the next best thing you can do for yourself and your family. Dress up your kitchen along with the rest of the house, and lead simpler lives filled with the best quality and comfort. Lana Hawkins is a crafty girl and an architecture student from Sydney, Australia. She is the editor-in-chief on Smooth Decorator. Lana enjoys writing about inspiring interiors and creative home improvement projects. Lana is interested in sustainability and green building, and that's where she gets most of her inspiration. In her free time, she loves cooking and spending time outdoors.